Kia Motors’ all-new 2018 Stinger fastback sedan has been honoured with an EyesOn Design award for Production Car Design Excellence at the North American International Auto Show (NAIAS) in Detroit. At an event typically dominated by introductions from American car companies, Kia’s Stinger stole the spotlight. The EyesOn Design Awards honour the best production and concept vehicles making their worldwide auto show debut at the NAIAS. This year's categories include Concept Car, Production Car, Concept Truck, Production Truck, Innovative Use of Color, Graphics and Materials, Interior Design, User Experience Award, and Designer Catalyst. 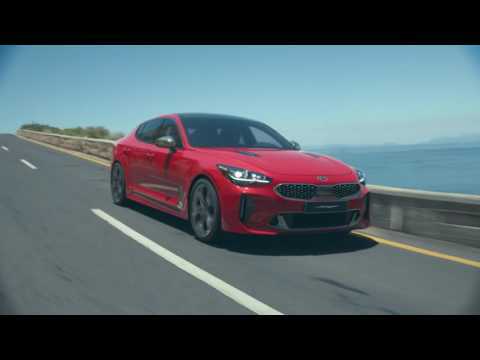 The design of the all-new 2018 Kia Stinger was overseen by Peter Schreyer and Gregory Guillaume, Chief Designer for Kia Motors Europe. Brimming with power, passion and performance, the 2018 Kia Stinger is a sport sedan dedicated to the thrill of driving, while cossetting occupants in luxury. From its sleek front through its svelte flanks, and up to its powerful haunches, the Stinger exudes a muscular confidence. The Stinger’s stance and visual balance are designed to lend the car an air of elegance and athleticism, rather than boy-racer aggression. Inside is a purposeful cabin that is luxurious and exquisitely crafted. A strong horizontal plane across the dash presents the driver with a thick, leather-wrapped steering wheel. Front and centre of the driver is a single instrument binnacle with a combination of analogue and digital instrumentation. Set to go on sale across Europe in the fourth quarter of 2017, the Stinger is backed by Kia Motors’ industry-leading quality and reliability. EyesOn Design Awards are the officially-sanctioned design awards for the NAIAS. Considered the validation of great automobile design from the industry's leaders, EyesOn Design awards are prominently displayed in design studios around the world.